2017 Supra SA 450, One ride behind the 2017 Supra SA, and the essence of precision engineering becomes explicitly clear. One look at its bold design and you'll ask yourself how such beautiful form can have so much function. With the crisp JL audio speakers, and the patent auto wake design you are bound to get the most out of your aquatic adventures! 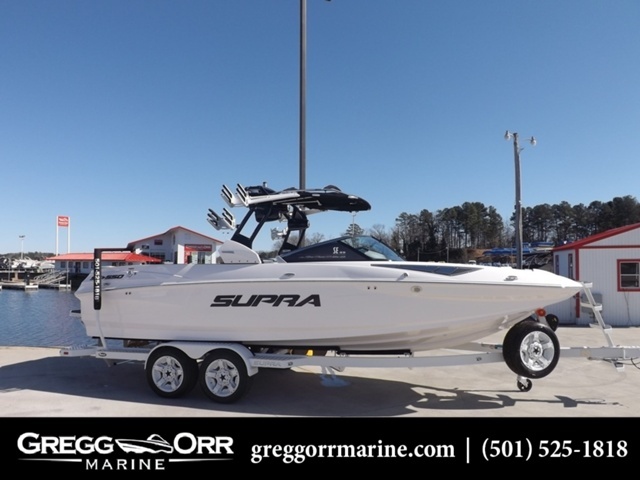 2017 Supra SE 450, 2017 Supra SE 450 Tow BoatThe SE is the flagship of the Supra Line. 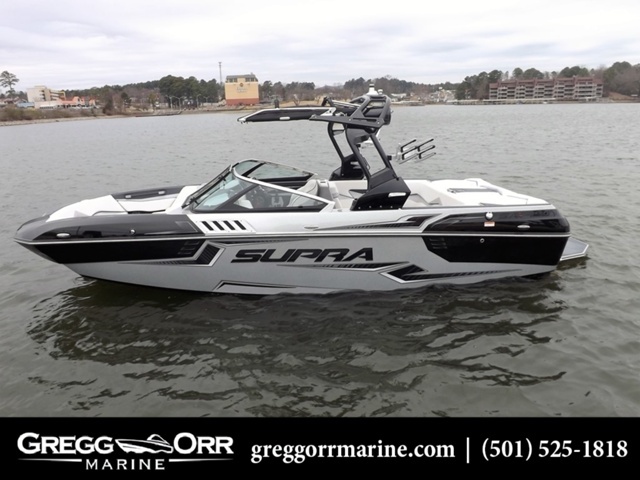 Providing industry-leading performance, precision-engineered features, refined interior comfort and bold design, the SE checks every box for the perfect towboat.FEATURES:- 440 6.2L Ford Raptor by Indmar- SUPRA Patented AutoWake System- Supra Vision Touch Dash System w/Navionics Navigation-Zero-Off GPS Speed Control- Column Levers For Cruise & Smartplate Adjustment-Supra Smartplate 2.0- Interior LED Lighting w/Aluminum Housings- Stowable Forward Bimini w/Storage Pockets & Cover- Power Height Adjustable Heated Captains Chair- Rear Facing Convertible Seat w/ Integrated Cockpit Table- LED Bar Docking Lights- Swivel Board Racks- Swell Surf System- SeaDek Flooring Upgrade- Stainless Steel Rub Rail (Black)- Underwater Lights- Boat Cover- Steering Wheel with Controls- Audio Remote - Transom Location- JL Audio Package (4 Tower Speakers)- JL 6.5 Cockpit Speakers w/ Blue LEDs- Supra Liquid Lead Ballast System (3,200lbs)- Vision Transom Camera- Dual Battery System with Onboard Battery Charger- Heater- Tandem Axle Boatmate TrailerSUPRA'S Patented AutoWake: Supra's revolutionary AutoWake technology responds to conditions inside the boat and adjusts ballast levels automatically to maintain optimal hull position for both surfing and wakeboarding. Get that 'perfect wake' every time you go out no matter the water condition or weight placement in the boat. 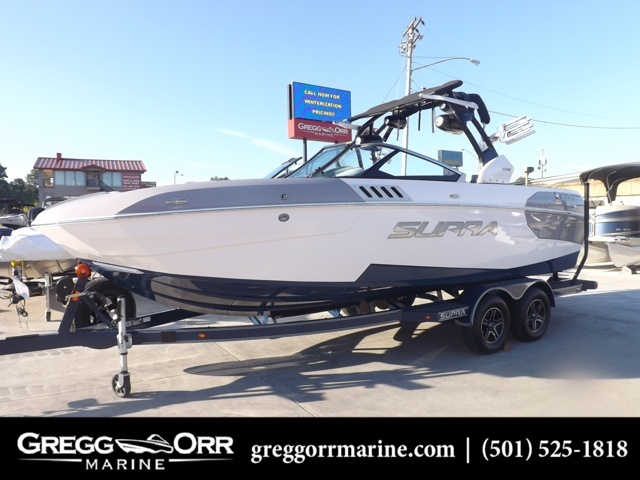 2008 Supra Gravity 24 SSV Excellent Condition, Only 305 hours and loaded with extras including custome wetsounds speaker install with 6 in boat speakers, 4 subwoofers & amps, additional ballast bags Everything about this boat is rider-first. That's what you'd expect from a special edition model that features the exact set up used by the Gravity Games Pros. 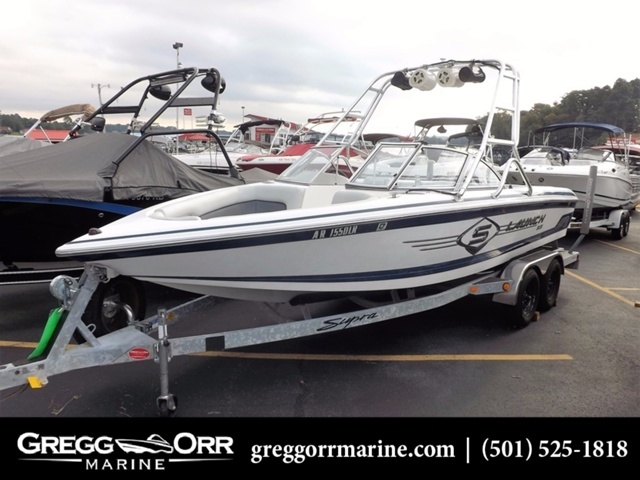 Start with 1,950 pounds of stock factory ballast and a powerful Indmar ETX CAT 5.7L V-8 340HP engine with catalytic converter as standard parts of the performance package. 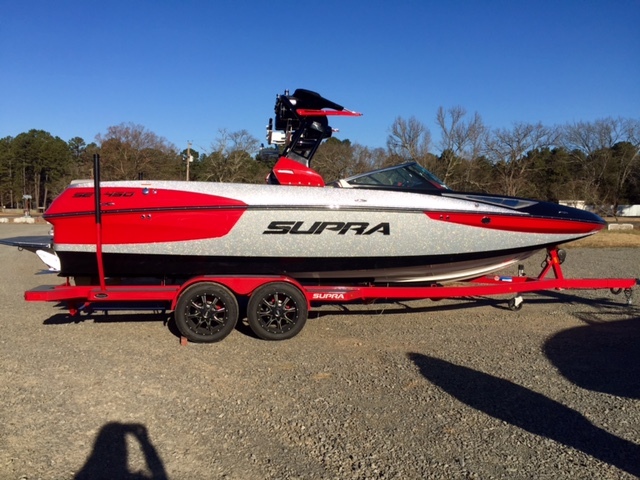 Plus, the color and graphics package lets the world know you're very serious about your sport and your boat. Everything on board is what you'd want in such a heart-pounding boat, including Z-Cargo Bimini, custom upholstery with stitched Gravity emblems, additional courtesy lights,twin-axle trailer with 18" wheels, and versatile rear-facing seating that gives up to seven watchers an incredible view of the rider. 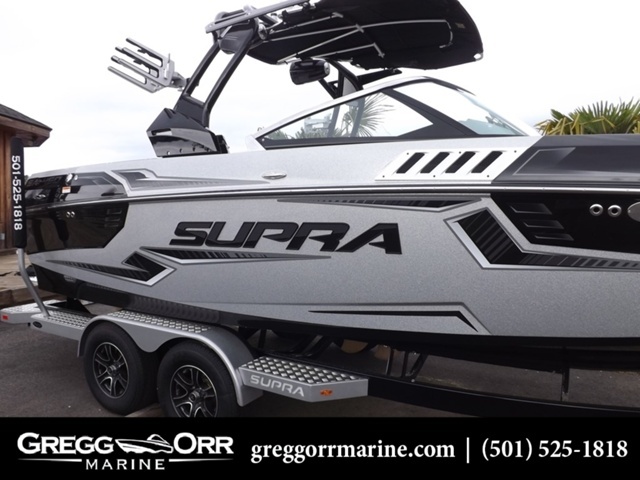 The Exclusive Supra Ride System comes standard and features the SmartPlate wake adjustment system that automatically adjusts wake plate settings to the rider's preferred wake size, steepness and ramp length, plus the fully integrated PerfectPass System which remembers the driver's preferred speed and holds it to within 0.2 mph. 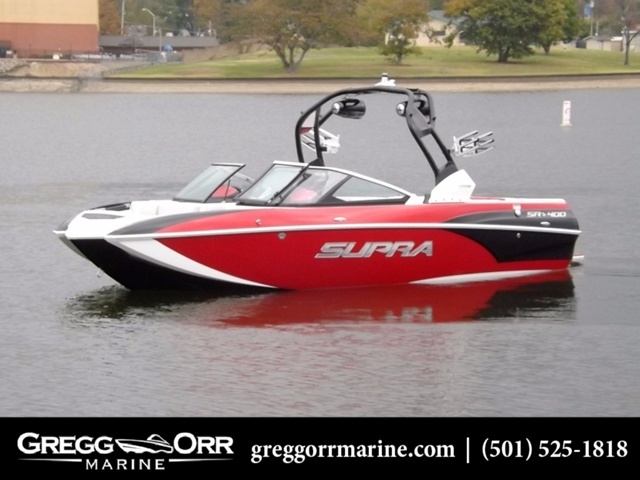 This is the official towboat of the Gravity Games. 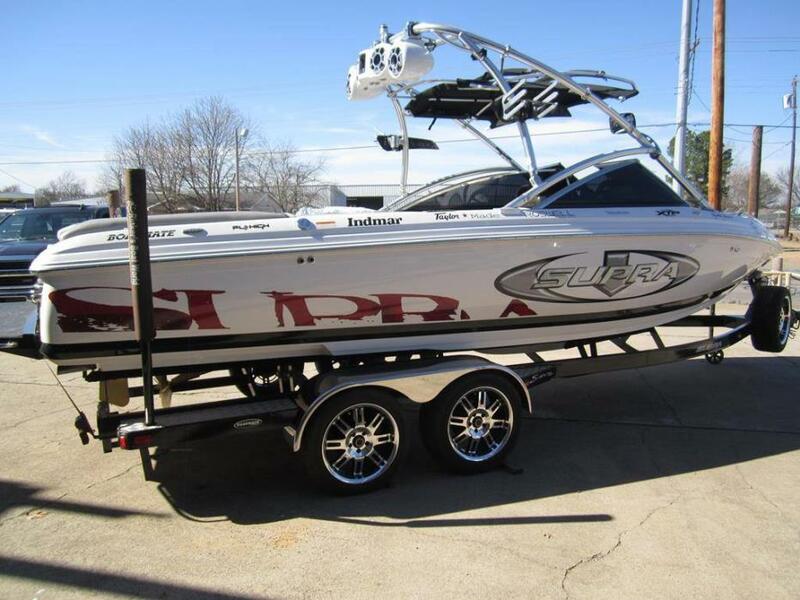 The official towboat of your next big lift off. 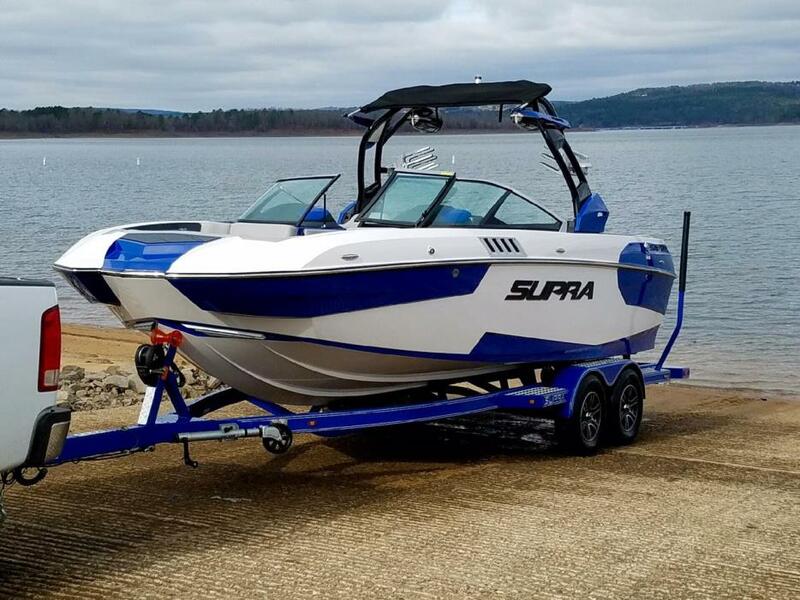 The official towboat of your next big air. 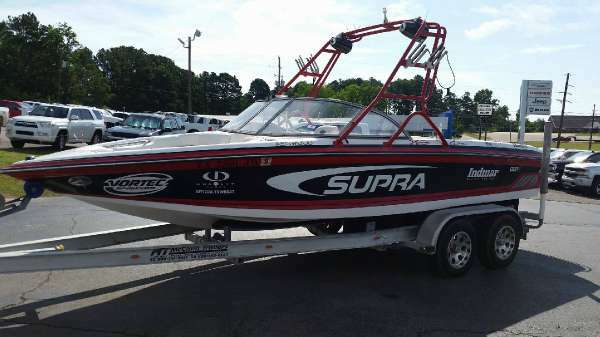 2009 Supra 22 SSV This fully loaded 2009 Supra Sunsport 22V Launch is in outstanding condition! 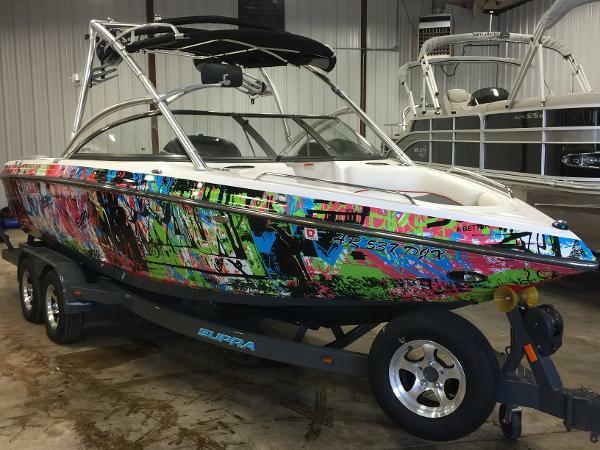 This boat has tons of extras including Rad-A-Cage tower w/ swing away wakeboard rakes, Wetsound Pro 80's speakers, Kicker amp, Perfect Pass speed control and more. 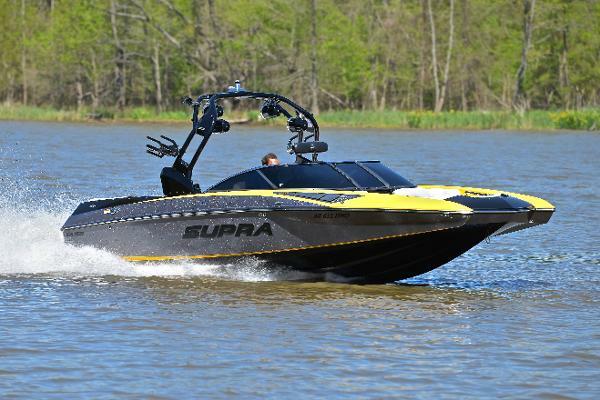 The boat has a custom wrap and powered by a 340 hp Indmar motor. 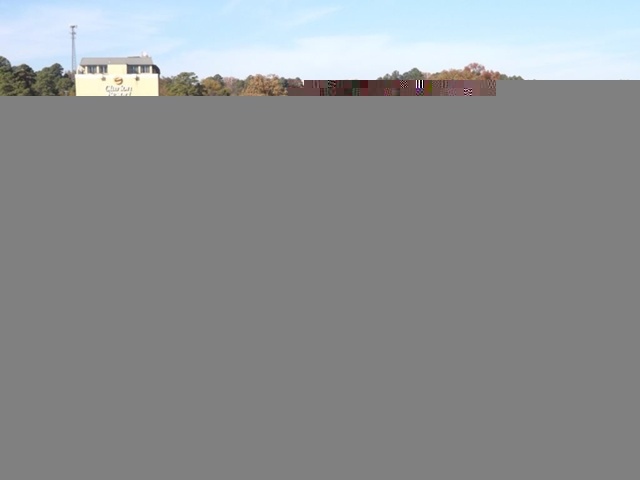 Triple ballasts, extra prop, built in cooler, room for 15 people. 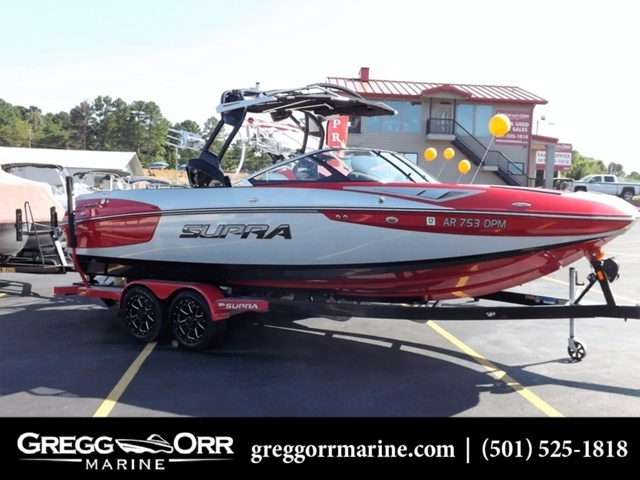 Come check it out at Hot Springs Marina.